Teddy Day is celebrated by offering adoration that that special stuffed animal that keeps us comfortable when it seems no one else can. 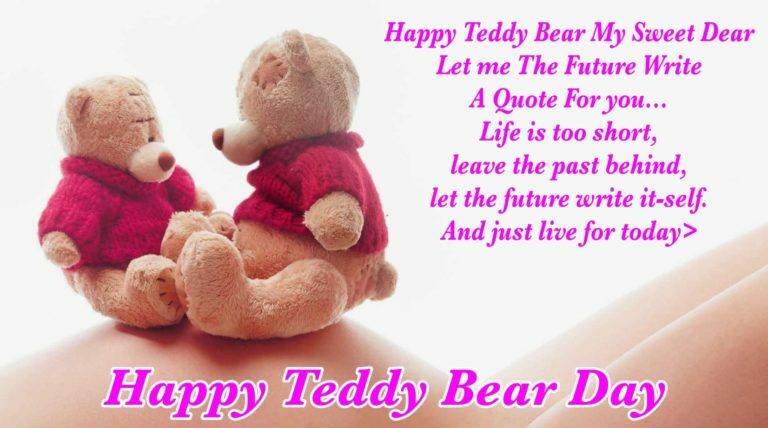 On this day a gift of a teddy bear is offered to express love for another. Scald 1/2 cup milk. Add 3 tablespoons of sugar, 2 teaspoons of salt and 3 tablespoons of butter. Stir until melted. Cool. Dissolve 2 teaspoons yeast (1 package baking yeast) into 1 1/2 cup warm water. Add to milk mix. Add enough flour (approx. 4 cups) to make moderately stiff dough. Knead 8-10 minutes. Place into greased bowl. Let rise until doubled. Punch down. Divide dough in half. With one half, divide into 2 pieces (for head and body). Divide rest into 7 pieces (1 nose, 2 ears, and 4 paws). Shape into bears. Let rise until doubled. Mix 1 egg and 1 tablespoon of water and brush onto bears. Make indentation in ears. Place raisins for eyes and belly button. Bake at 350 degrees for 20-25 minutes.